Finally, Vanessa got her tattoo. Probably most don't know, but she has wanted one for a few years now. What has held her back is not really knowing what tattoo, although she has always known she wanted her own design. At first it was going to be a stambecco in Italian or an alpine ibex in English, a beautiful animal that lives in the Alps and is an excellent rock climber. The reason for the stambecco/alpine ibex is because I love mountains, I love to hike/climb, and I especially love to trail run through mountains with lots or rocks where you kind of have to leap around. Then it was going to be a newt to catch the meaning of Nature and its potential fragility from our own human hands since amphibians are very susceptible to pollution and loss of habitat. Years went by, but it was always going to be an animal because I love animals, I find them fascinating, special, almost (or totally) spiritual and able to provide humans with a connection back to Nature... where after all we come from -- even if accounting for God there is Nature between God and us. Then for just over a year or so, I have been reading about the fact that my interests and feelings of a spiritual connection with Nature might be well founded (i.e. not just typical Vanessa's craziness) and are very ancient; this brought me to neolithic Celtic culture or older, another interest and spiritual connection of mine. This in turn and brought me again to more realizations: the ancient Celtic origins of where I come from (i.e. Gallia Cisalpina), which I actually studied in school and guess what... managed to forget with my powerful ability to remember – not! In any case, after an iteration of personal/spiritual growth/search, I have arrived to making my own design! 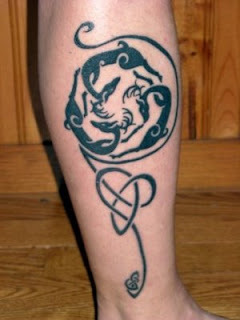 The design does capture what I wanted: animals, specifically deers, for which I have always had even more special awe, the number 3, which carries many important meanings in ancient and Celtic cultures as well as in my life, and the circle or wheel, which again is a spiritual symbol throughout many ancient cultures. So here's what I came up with... yes that is my leg or calf to be more precise. I must explain the reason for the location: at first, at the time of the stambecco/alpine ibex I actually wanted to tattoo on my leg, but it was going to be the thigh; then at the time of the newt it was going to be exactly the same, the calf; then while creating my latest design it was going to be my lower arm. What changed you might ask? I guess you can call it something not very spiritual, but purely practical and related to today's world: work. Yes like everybody else I got to eat and have a roof over my head... so I got to work and make money and since the path I have chosen does not usually allow for tattoos to be visible the arm was not going to work; no way I am wearing long sleeves throughout the summer!